Our classes engaged in lots of activities during Science Week. 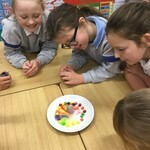 The 2nd & 4th classes really enjoyed their workshops where they got to become scientists and carry out really interesting experiments. Lots of our classes took part in Lego education and had lot's of fun carrying out experiments using constructed pieces of Lego e.g skyscrapers.